Minecat: A Whole Lot of Ocelots - A Feline Minecraft Adventure is book 1 from the children's series by P.T. Evans. Jason’s cat, Spike, is convinced he can play Minecraft much better than Jason, and will not make those stupid mistakes either. His opportunity comes when he is sucked into the actual game on the laptop. Spike makes a few changes to improve the scenes Jason had created. While enjoying the activities, he meets a few creepers and giant spiders who are menacing. One even tries to bite his tail, but Spike manages to escape. He is unaccustomed to hunting for his own food, but feels like a real cat now. He is hungry, but cannot catch the chickens, so he explores the woods instead. Spike does not want to be chased by ocelots so he hatches a plan to befriend them, hoping he survives with his nine lives. Minecat: A Whole Lot of Ocelots by P.T. Evans is a fun novella for children from the Minecraft series. Spike is witty and his antics are amusing. There is an actual photo of a cute cat chasing a butterfly in the story, so I assume it is Spike, as he is sketched in the Minecraft illustrations. P.T. Evans's writing style is lively and simple to comprehend so kids will not have trouble following Spike's escapades. Minecat: A Whole Lot of Ocelots is from the series that the author created specifically for children. Those who play Minecraft games will like reading this novella. Recommended. One of the difficulties in getting young people to read is finding things that capture their attention and reflect their interests. P.T. Evans has met this challenge in Minecraft Cat, offering young readers a story placed inside a video game that is popular with young grade-schoolers. With artwork that includes renditions of characters from the game, along with some original cartoon drawings of Spike, young readers will quickly make their way through this chapter-book. No doubt they will be delighted to learn that it is one of a series, which is sure to keep them coming back for more. 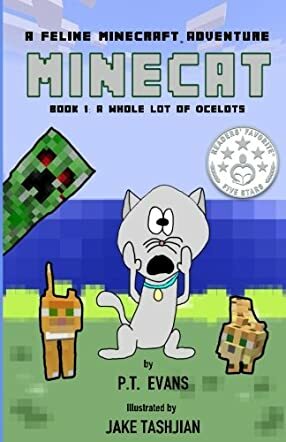 Minecat Book 1: A Feline Minecraft Adventure: A Whole Lot of Ocelots is an adventure tale for children, grades 4-6, and preteens, written by P.T. Evans and illustrated by Jake Tashjian. Spike's an indoor cat, and he's not at all impressed with being housebound. He'd much rather be outdoors chasing birds with Lily, the cat who lives next door. But no, he's stuck inside, so he makes do with watching as his human companion, Jason, plays Minecraft. Jason thinks he's a master of Minecraft, but Spike thinks he could play a lot better if he were only given the opportunity. Spike sees things that Jason totally misses, and Jason makes the most elementary mistakes -- like digging down into lava with his pick-axe. One day, though, something very strange happened. After Jason fiddled with his computer and the game to make it run more quickly, his mom called him away before he could test the results. Spike would normally tag along with Jason to see what's happening, but he found himself mesmerized by the colors. Spike's always loved the spinning color wheel, but it's acting strangely now, and he just can't resist its pull. P.T. Evans' adventure tale, A Whole Lot of Ocelots, is funny and exciting all at once, and you don't even have to be an avid Minecraft gamer to appreciate Spike, the wisecracking kitty whose adventures in Minecraft are very special indeed. Spike is a consummate gamer and watching him create his world had me seriously considering getting into Minecraft myself. Jake Tashjian's illustrations are fun and perfectly suited for both the mood and the action in the tale. Will Spike star in the next volume of Minecat? I hope so. I'm quite curious to see what changes and ideas he comes up with next. Minecat Book 1: A Feline Minecraft Adventure: A Whole Lot of Ocelots is most highly recommended.